On Sunday November 18, 2018, my beloved father, Jerry Smith, went home to be with the Lord. Jerry's passing was sudden and unexpected. Jerry was married to his loving wife Lorna for more than 30 years. 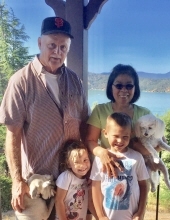 Jerry had one daughter, son-in-law, two grandchildren and two great grandchildren. He simply adored them all. Originally born in Oklahoma City, Jerry moved to California in the late 60’s with his family. He was a skilled auto body fender professional. After working in San Francisco for many years, in 1981, he decided to open his own auto body shop with his daughter, Cindy Smith Rudy, in San Leandro CA. Prestige Auto Body flourished for decades. Jerry was an active Elks member while he lived in San Leandro. He gave to many charities. Jerry had a particular affection for mistreated and/or abandoned animals. He would regularly feed the animals. They would all come to see him when he arrived to care for them. We would refer to him as Dr. Dolittle. Jerry had a passion for ocean fishing. He loved the California Coast line. If he wasn’t home, you knew he was fishing, crabbing or digging for clams along the Fort Bragg Coast. Jerry was passionate about his health and fitness. Jerry didn’t smoke or drink. He was an active cyclist. He completed his first metric century ride with his daughter at 69. Jerry wore a Fitbit and loved to brag to his family about his Fitbit badges. We couldn’t keep up with him. He regularly exceeded 11,000 steps a day. His weakness was a fresh donut (or two) and the occasional Fosters Freeze Root Beer Float on a hot summer day in Clearlake. Jerry is survived by his wife Lorna Smith, daughter, Cindy Smith Rudy, son-in-law Frank Rudy. Granddaughters Tiffany Nugen, Stephany Beghin, husband Dan Beghin. He was blessed to have two Great Grandchildren, Dillan and Sophia. Jerry has three sisters and two nieces in Oklahoma City, Carolyn, Theresa, Linda and nieces, Kim and Danielle. Jerry will be truly missed by all. However, we all have such beautiful and funny memories. He was the best father a girl could ever have. He leaves a legacy of love, kindness and values which has been ingrained in all of us. To send flowers or a remembrance gift to the family of Jerry Lee Smith, please visit our Tribute Store. "Email Address" would like to share the life celebration of Jerry Lee Smith. Click on the "link" to go to share a favorite memory or leave a condolence message for the family.